For more than 30 years Joe Berrios has been a masterful practitioner of pay-to-play politics, first at the Cook County Board of Review and since 2010 as county assessor. From 2015 to 2017, Berrios has raised $2,032,131, with the dollars flowing into three campaign committees: The assessor account ($552,798), the 31st Ward Berrios account ($552,660), and the 31st Ward Democratic Organization account ($926,673), where Berrios is the committeeman. As of Dec. 31, he had $1,435,673 on-hand, slightly more than the $1,360,651 he had on-hand on Dec. 31, 2014. He did not get those donations because he was sweet and kind, or loveable and sensitive, and was doing a spiffy job as assessor. Berrios mostly got that money from lawyers who represented the owners of large industrial and commercial properties, apartment complexes, mega-condominiums, Gold Coast and North Shore "McMansions," plus real estate developers, for whom his office had graciously granted their appeals, reduced their assessed valuations, and saved them millions in property taxes. The quid pro quo was TLTR, an acronym for Tender Loving Tax Reductions in exchange for TLCD, an acronym for Tender Loving Campaign Donations. An "assessed valuation" of any of the county’s 1.8 million taxable parcels, done by assessor staffers, is arbitrary and subjective. The "mission statement" on the assessor’s website states that the "taxability and value of property" is determined by "field inspection, structural measurement, calculation, sales analysis, income and expense analysis, market trend studies, and inspection of new construction and major improvements to determine values." Then an assessed valuation is assigned, which can then be appealed, using such pretexts as vacancies, lack of revenue, damage, declined value and/or the cost of improvements. One-third of the county is reassessed every year. An appeal is also wholly arbitrary and subjective. The property owner submits "documentation," and the assessor, without a hearing, can reduce the assessed valuation. If that fails, the Board of Review is the next step. Not many cared about this process until the Chicago Tribune, ProPublica Illinois, and the University of Chicago Center for Municipal Finance began publicizing what they termed the "inequities" in the tax assessing system during 2017, with the Tribune "Tax Divide" series positing that Berrios’s assessment system was "riddled with errors which created deep inequities…cutting a break for high-value properties…and punishing small businesses" and lower-valued property owners and "creating a cottage industry of politically powerful tax attorneys." The coup de grace was the Civic Consulting Alliance’s February report, commissioned by the county, which said Berrios oversees a "very regressive system" which causes a "wealth transfer from owners of lower-value homes to those of higher-value homes." That makes perfect sense. If those who should be paying more property taxes pay less, then those who should be paying less pay more, as all the taxing bodies need their pre-determined revenue. In short, Berrios’s "errors" seemed to be generating a lot of campaign cash. Berrios was also beset by ongoing media exposure of nepotism and the plentiful number of relatives on his payroll. That squishing sound heard thereafter was Berrios being thrown under the proverbial bus. Berrios’s principal opponent was Fritz Kaegi, a wealthy mutual fund asset manager from Oak Park, who styled himself a "progressive." Kaegi pledged "reform" and "transparency." Democratic politicians and tax attorneys intuitively understood that meant NO MORE PAY-TO-PLAY, which meant a substantial diminution in income. Tax attorneys are paid on contingency, getting one-third of the amount of the first year’s tax savings. Also running was Andrea Raila, whose nominating petitions were challenged by attorneys linked to Kaegi, and she spent the whole campaign immersed in litigation, first having a county hearing officer remove her from the ballot, a county judge upholding that ruling – but not before ballot were printed – and then having election judges handing out a flyer at early-voting polling places stating that a vote or her would not be counted. Just before the primary, the Illinois Supreme Court reversed and stated that she is "on the ballot." The premise of Kaegi attorneys was that he wanted a one-on-one with Berrios, and that Raila would drain votes from him. It didn’t work out that way, but it could have. The final countywide vote was 325,624 for Kaegi, 242,065 for Berrios, and 146,634 for Raila. Kaegi spent $1.6 million, and topped Berrios by 83,559 votes, an unimpressive number considering Berrios’s baggage. Kaegi beat Berrios in Chicago 179,598-141,156, getting 50 to 60 percent and higher along the Lakefront and somewhat less in the outlying wards, with 54.4 percent in the Northwest Side 45th Ward, 53.4 percent in the 41st Ward, 54.7 percent in the 39th Ward, 56.2 percent in the 40th Ward, and 47.8 percent in the 38th Ward, all white majority areas. But on the Southwest Side, Kaegi got 28.2 percent in Mike Madigan’s 13th Ward, 32.8 percent in Bill Lipinski’s 23rd Ward, 41.5 percent in Bill Daley’s 11th Ward, and 52.8 percent in the 19th Ward. The suburbs (see chart) went for Kaegi 146,026-100,909, with 64,244 for Raila. Speculatively, had Raila mounted a visible campaign, she could have drawn another 20-30,000 votes, at Kaegi expense. The Raila vote, and about 20 percent, was primarily gender-based, with women voting for a woman. The Berrios-Preckwinkle strategy – and remember, Berrios is chairman of the county Democratic Party, and Preckwinkle the vice-chairman, and Preckwinkle controlled slatemaking last summer – was to have Berrios piggyback on her in predominantly African American neighborhoods. On March 20, Preckwinkle got close to 75 percent of the black vote in her primary against white former alderman Bob Fioretti, and the expectation was that Berrios could come close to that threshold. Also, that Berrios would get 60 to 70 percent of the Hispanic vote. The minority vote, especially against split opposition, should have given Berrios 38 to 40 percent, and a victory like in 2010; instead he got 34 percent, to Kaegi’s 45 percent. 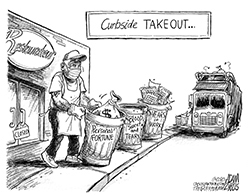 Preckwinkle, who was thought vulnerable because of her soda tax imposition and subsequent non-imposition, and because she reimposed the one percent sales tax hike, either would not or could not deliver for Berrios. She beat Fioretti 442,108-285,069. Countywide, she got 200,043 more votes than Berrios did, who had 242,065. There was no piggybacking. She topped Fioretti by 157,039 votes. In the black wards and townships, Preckwinkle got 61,943 more votes than Berrios. In the Hispanic wards and townships, she got 12,535 more votes than Berrios. On the South Shore, for example, where Preckwinkle’s allies occupy the aldermanic seats and committeemen posts, and where Preckwinkle was formerly an alderman, Preckwinkle averaged about 65 to 70 percent in the 2nd, 3rd, 4th, 5th, 6th, 7th and 8th wards, while Berrios barely cracked 40 percent. In fact, Kaegi actually topped Berrios’s vote in the 2nd, 3rd, 4th and 5th wards. On the West Side, where public sector union operatives were allied with Preckwinkle because the repeal of the soda tax caused job layoffs, a concerted effort was made to defeat Commissioner Richard Boykin (D-1st), an outspoken soda tax critic who pondered a run against Preckwinkle. It succeeded. He lost by 436 votes. Preckwinkle got 60 to 65 percent of the area’s vote, but Berrios less than 43 percent. As an aside, Preckwinkle promptly declared her intention to seek the post of county Democratic chairwoman when the 80 committeemen meet on April 18. Berrios is history. Berrios, of Puerto Rican heritage, is the most prominent Hispanic in county government, but that didn’t stop his rivals, Chuy Garcia and Luis Arroyo, from doing their utmost to bring him down. Garcia, county commissioner and 2015 Chicago mayoral candidate running for Luis Gutierrez’s open 4th District, endorsed Kaegi. In Garcia’s Mexican-American South Side base, Berrios lost the 12th Ward 1,736-1,689 but won the 22nd Ward 1,906-1,329. In the Northwest Side 36th Ward, just west of Berrios’s 31st Ward, where Arroyo is the boss, the vote was 1,797-1,679 for Kaegi. Even in his own ward, Berrios won by a meager 2,279-1,569. In sum, minority property owners who voted clearly understood before March 20 that Berrios was no friend of theirs, and responded accordingly. Berrios’s self-serving policies were costing them money. He had to go. In white liberal enclaves like Evanston and Oak Park, where voters understood the import of the assessor’s pay-to-play antics, Berrios was crushed. He lost 10,956-3,386 in Evanston and 10.040-2,376 in Oak Park. Overall, Kaegi beat him by 45,117 votes in the suburbs. Berrios is proof that money may buy happiness, but it cannot forever conceal poor performance and bad judgment. Send e-mail to russ@russstewart.com or visit his Web site at www.russstewart.com. Base Pay + Commission + Tips! The Nadig Newspapers office is open Monday through Friday. Each department has different hours which can be found by clicking on their department page link on the top part of the website. 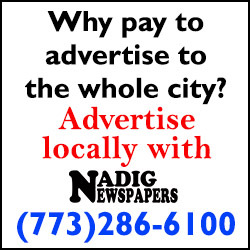 Monday - Thursday 06:00 a.m. - 05:00 p.m.
Friday 06:00 a.m. - 04:00 p.m.
Nadig Newspapers - Northwest Side Local Newspapers © 2019. All Rights Reserved.